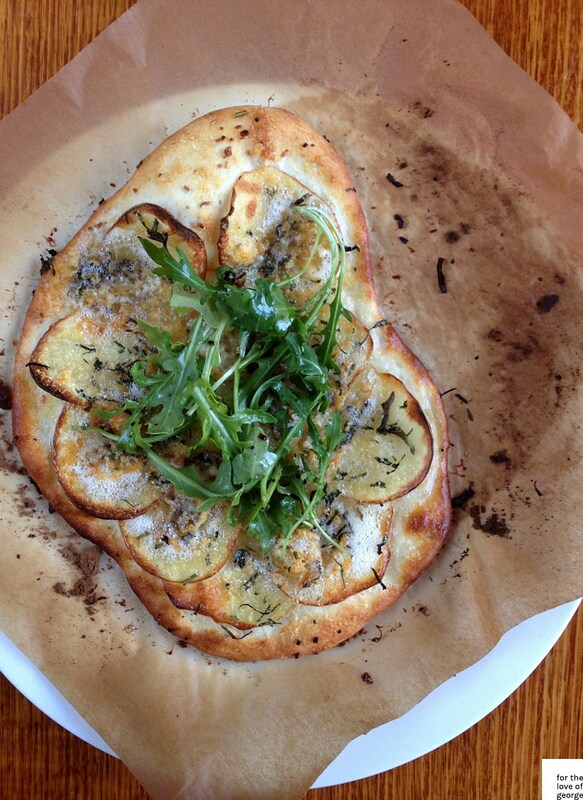 Heavenly: Potato, blue cheese and rocket pizza on a homemade base. I love the way the blue cheese goes all bubbly and frothy, and gives a salty kick to the potato. I will definitely be making this again! For the dough, place flour and a pinch of salt in the bowl of an electric mixer with a dough hook attachment. Dissolve yeast and sugar in 3 tablespoons warm water, stirring to make a smooth paste, and add to the flour along with the 1 tbs oil. Mix on low speed for 8-10 minutes, gradually adding more tepid water (about 200ml), until dough is soft but not too sticky. Turn out on a lightly floured surface and knead for 5-7 minutes until smooth and elastic. Place the dough in a lightly oiled bowl and brush with a little extra oil. Cover with a damp tea towel and set aside in a warm place to prove (rise) for 45 minutes or until doubled in size. Preheat a pizza stone or tray on a barbecue at 250°C or oven at 230°C. Divide dough into 5 balls and roll each out on a sheet of lightly floured baking paper to about 2-3mm thick (they don’t have to be perfectly round). Stack bases on their paper, cover with a damp tea towel and refrigerate until ready to cook – this will stop them rising further. Rinse potatoes in a colander and pat dry with a clean tea towel. Stir garlic with 3 tbs of the oil, then brush over bases. Scatter with potato, herbs and cheeses. One at a time, transfer pizzas (on paper) to the pizza stone or tray, cover with hood and cook on the barbecue for 3-5 minutes (or in the oven for 5-8 minutes), until the base is golden and cheese melts. Toss rocket with remaining oil, season, then use to top pizzas. Serve immediately. Recipe by Ben O’Donohue, published in Australian Delicious Magazine, issue 89. This entry was posted by Lauren (blog author) in Food and tagged blue cheese, gorgonzola, pizza, potato, recipe, rocket, rosemary.